Oftentimes, I like to reflect upon how and why the cannabis community has made such great strides in recent years. Authors, chief petitioners, spokespeople, funders and advocates associated with prominent reforms capture the headlines and media attention, but the truth is that we all stand upon the shoulders of giants who came before us. So many people have suffered so much through the years of marijuana prohibition and have sacrificed so much to get us to where we are today. And we will see many more victories that will build upon the more recent advancements. Sure, we’ll suffer a few setbacks along the way and lose an election or two, but it is apparent to me that the days of cannabis prohibition are numbered; and I am certainly not alone as three-fourths of Americans agree that legalization is inevitable. When thinking about the most important marijuana law reformers of all time, I have been wondering about who would be on my Marijuana Mount Rushmore. As a big sports fan (if you aren’t a sports fan feel free to skip the rest of this paragraph and the next), my thought process has been inspired by recent talks about who would be on professional basketball’s Mount Rushmore. In any list that includes just four choices, there are going to be worthy candidates snubbed. NBA great LeBron James famously stated that he would be one of the top four basketball greats when his career is over, putting himself onto the game’s Mount Rushmore. James named his basketball Mount Rushmore as Michael Jordan, Magic Johnson, Larry Bird and Oscar Robertson. Hall of Famer Kareem Abdul-Jabbar took offense to the list. Last year’s MVP, Kevin Durant, had three-fourths the same members as LeBron on his all-time NBA Mount Rushmore, with Kobe Bryant replacing Oscar Robertson. Some basketball greats that are getting left off by James and Durant include: Abdul-Jabbar, Wilt Chamberlin and Bill Russell. It is hard to pick only four, especially when you haven’t seen some of the all-time greats play. For me, I go: Russell, Abdul-Jabbar, MJ & Magic. While some greats have to be snubbed on such a list, I’m confident that my choices are defensible as each can arguably have a case as the greatest of all-time. 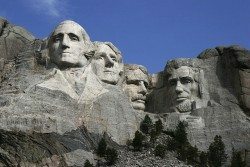 When coming up with the four greats to place upon the Marijuana Mount Rushmore, I am thinking mainly about cultural significance and helping the cannabis community get to where we are today. Without further ado, here would be my all-time Marijuana Mount Rushmore: Jack Herer, Bob Marley, Carl Sagan and Willie Nelson. My honorable mention, in no particular order: Cheech & Chong, Snoop Dogg, Michael Phelps, Dennis Peron, Jon Stewart, Seth Rogen, John Lennon, Paul McCartney, Congressman Earl Blumenauer, Raphael Mechoulam, Sanjay Gupta, Ethan Nadelmann, Peter Lewis, George Soros, Bill Maher, Elvy Musikka, Debby Goldsberry, Irv Rosenfeld, Marc Emery, Dan Viets, John Sajo, Leland Berger, Ed Rosenthal, Gary Johnson, Allison Holcomb, Mason Tvert, Jerry Garcia, Hunter S. Thompson, Woody Harrelson, Michael Franti, Rick Steves, Mark Stepnoski, Jack Black, Keith Stroup, Rob Kampia, Sean Penn, William O’Shaugnessy, Joe Rogan, Louis Armstrong, Peter Tosh, Ann Druyan and Bob Dylan. Known as the “Emperor of Hemp” or simply “The Hemperor,” the author of The Emperor Wears No Clothes, is truly a prophet of the movement to legalize hemp and cannabis. He was fearless and he trained and inspired many cannabis activists who have trained and inspired even more cannabis activists. Virtually unwilling to compromise on his beliefs, the man wasn’t infallible, but his impact on the cannabis law reform movement is immeasurable and continues to this day. And oh yeah, he has a cannabis strain named after him. Bob Marley viewed the use of cannabis as sacred and his music has inspired and entertained millions of people across the globe. A Rastafarian, he gained international fame and was never shy about his use of cannabis, both in his music and in his personal life. Marley stated that, “When you smoke herb, herb reveal yourself to you. All the wickedness you do, the herb reveal itself to yourself, your conscience, show up yourself clear, because herb make you meditate. Is only a natural t’ing and it grow like a tree.” He was named Band of the Year by Rolling Stone in 1976; BBC named “One Love” the Song of the Millennium; he was inducted into the Rock and Roll Hall of Fame in 1994; the United Nations awarded him the Peace Medal of the Third World; and he was awarded the Jamaican Order of Merit, Jamaica’s highest honor. Carl Sagan was a scientist that could communicate scientific concepts to the masses and he has had a great impact on top scientists today that have followed in his footsteps, such as Neil DeGrasse Tyson. Sagan won too many awards to list them all: his TV show Cosmos won a Peabody and a couple of Emmys; he won a Pulitzer Prize for Non-Fiction; and the Discovery Channel named him the 99th Greatest American of all-time in 2005. An avid user of cannabis, Sagan unfortunately felt that he must reside in the cannabis closet during his lifetime. He contributed an essay bout his use of cannabis in the 1971 book Marihuana Reconsidered under the pseudonym “Mr. X.” The essay explained how marijuana helped inspire his works and enhance his intellectual experiences. Sagan’s cannabis use became known widely after the publication of his biography in 1999. His widow, Ann Druyan, went on to serve on the board of directors for the National Organization for the Reform of Marijuana Laws (NORML). Perhaps the greatest achievement of Sagan’s, within the cannabis community, is the fact that he completely obliterated the “stupid stoner” stereotype, demonstrating that one can use cannabis and be one of the greatest scientific and intellectual minds of all-time. My only living member of the Marijuana Mount Rushmore is the musical legend Willie Nelson, who will turn 82 years-old on April 29th. An unabashed marijuana smoker, Nelson still records and tours with the best of them, out-performing musicians half his age. An American icon, and one of the main Outlaw Country musicians, Nelson has won 37 different major musical awards, including 11 Grammys. Nelson, with credibility among many different demographics, including more conservative folks, has used his celebrity to benefit many causes, from marijuana legalization to family farmers to LGBT rights to hemp and biodiesel fuels. He even appeared in over 30 films and has authored several books, including Roll Me Up and Smoke Me When I Die: Musings from the Road. So there is my list. It is certainly subjective and arguments can be made for many of the folks that I listed and some that I didn’t. Comedian Rob Cantrell and a marijuana smoker he interviewed went with Louis Armstrong, Snoop, Bob Marley and Sean Penn. Feel free to let me know who you would place on your Marijuana Mount Rushmore and whether I have any glaring omissions. Update: I’ve made some additions to the honorable mentions and will continue to do so thanks to the many thoughtful responses I’ve gotten.